Are you brave enough to adventure into the Glassworks? 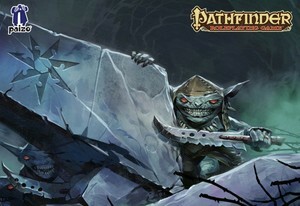 I'll warn you, it's rumored that Goblins have taken over. No one's been seen leaving the great hulking building for the last couple of days, and it's barricaded from the inside. At first when you break in you'll hear the dull distant roar telling you that the furnaces are still running and as you get closer and closer to the working rooms the roar increases, but there are also other noises, the distant sounds of glass smashing and Goblins squabbling. If you can surprise them, you might have a chance, but don't let them bullrush you into the ovens. If you can kill their half-elf leader they'll probably flee. Good luck with that! This SoundSet contains all the music and atmosphere you need to immerse your players in the Glassworks encounters of "Burnt Offerings", the first chapter of the wildly popular "Rise of the RuneLords" adventure path.